I was attempting an ambitious hike this time. 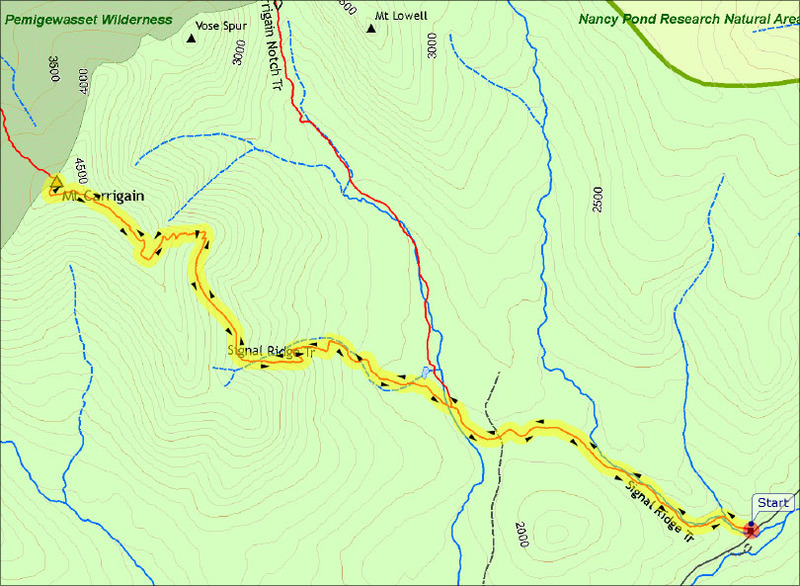 My plan was to park at the Signal Ridge Trailhead, climb Mt Carrigain, descend via the steep Desolation Trail, make my way to Stillwater Junction on the Carrigain Notch Trail, and then hike the entire length of the Wilderness/Lincoln Woods Trail out to the Lincoln Woods Trailhead and get a shuttle back to my car. I actually had two purposes in mind, The first was to climb Mt Carrigain again and hike the Desolation Trail and a portion of the Wilderness Trail I had never been on. The second was to photograph the suspension bridge over the East Branch of the Pemigewasset, just beyond the Bondcliff Trail and Black Brook bridge. The Forest Service was planning on dismantling both the suspension bridge and the Black Brook bridge a couple of days later, so it was either now or never. Usually, I plan a trip based on near perfect weather, but I didn't have the luxury this time, and as it turned out, it had rained quite a bit the night before. 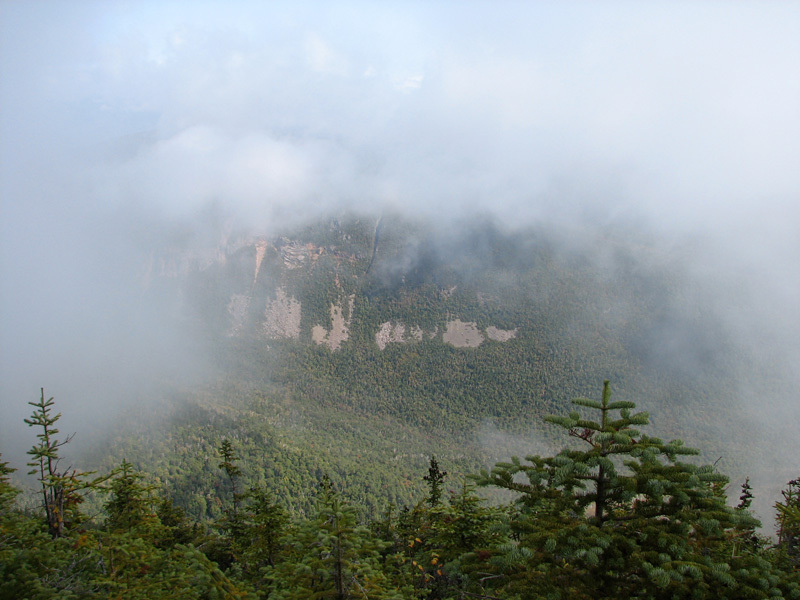 It was still cloudy with a bit of mist in the air when I started up the Signal Ridge Trail in the early fall morning. I was hoping that it would clear by the time I reached the top. The Signal Ridge Trail started off relatively flat, and then soon crossed Whiteface Brook, following the brook up an old logging road, and passing many small cascades, as well as a beaver pond. Then, after passing the junction with the Carrigain Notch Trail, the trail began to ascend more steeply. A couple of switchbacks later, I entered a straight birch-lined section that angled moderately up the east side of Signal Ridge for about a mile. Occasional glimpses down into the fog-enshrouded notch below were not promising of a break in the weather. Past the straight section, the trail veered left and switchbacked its way up the steep ridge as the trees got smaller and scrubbier. Eventually, I broke out into the open and was met with a cool foggy wind, with broken views through the shifting mist over to Vose Spur and down into Carrigain Notch. Ahead of me was the former fire tower (now an observation platform) at the top of the summit cone, which looked deceptively close, but which was still a bit of a climb away. The trail circled around the summit cone to approach it from the opposite side; on the way, I passed the site of the former fire warden's cabin and well. After a final steep pitch, I made it to the small summit clearing, which was dominated by the steel framed observation tower. By now, I was thoroughly tired, and was having some serious doubts about heading down the steep, wet, and very likely slippery Desolation Trail. To make matters worse, my cell phone had somehow used up most of its power, which would make it impossible for me to call for a ride when I got to Lincoln Woods. Giving it some thought, I reluctantly settled on returning the way I came, and then driving over to Lincoln Woods and hiking up the Wilderness Trail to the bridges I wanted to photograph. At the top of the tower, I met a couple who had been resting up there and eating their lunch. They were excitedly feeding the leftovers to a very persistent Gray Jay, which veered in and sat on the railing waiting for the next handout. This allowed me to get a couple of good clear pictures, something I rarely get because Gray Jays usually aren't still long enough to take a decent closeup. From the couple's conversation, I gathered that they had never encountered a Gray Jay this close before. This Gray Jay would be well fed today. The cold wind and permeating fog made it quite chilly on top of the tower, but I was okay for a while after generating a lot of heating by climbing, so I didn't put on my jacket right away. 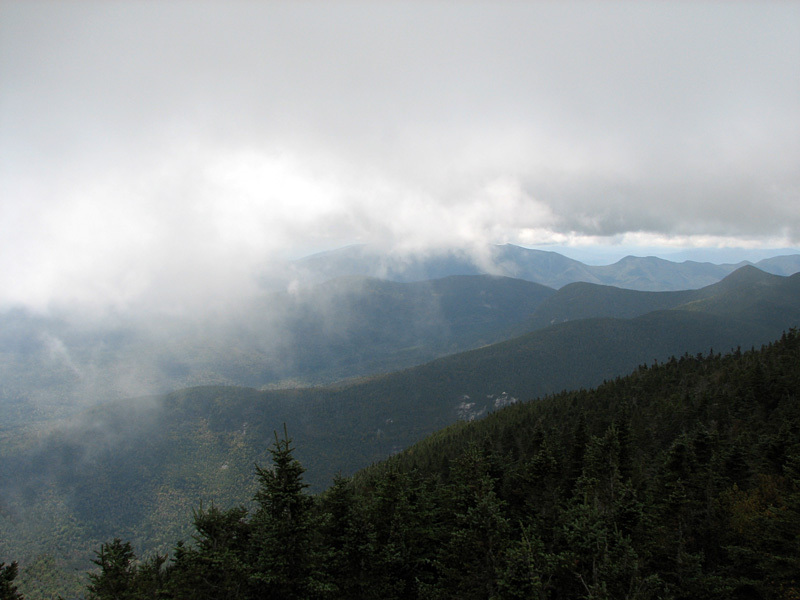 As the fog drifted about, I was able to get brief glimpses (and photographs) of the western Pemigewasset Wilderness, the Bonds, Owl's Head, Franconia Ridge, and southern Presidentials. It was disappointing not have clear sunny views, but the fog was interesting in its own way. Mountain fog always ebbs and flows in the unseen wind currents circling around the peaks, seemingly giving it a life of its own. Knowing that I still had another long hike ahead of me, I soon headed back down to my car. I made good time thanks to the mostly easy footing, and immediately began my drive through Bear Notch and up the Kancamagus Highway to Lincoln Woods. 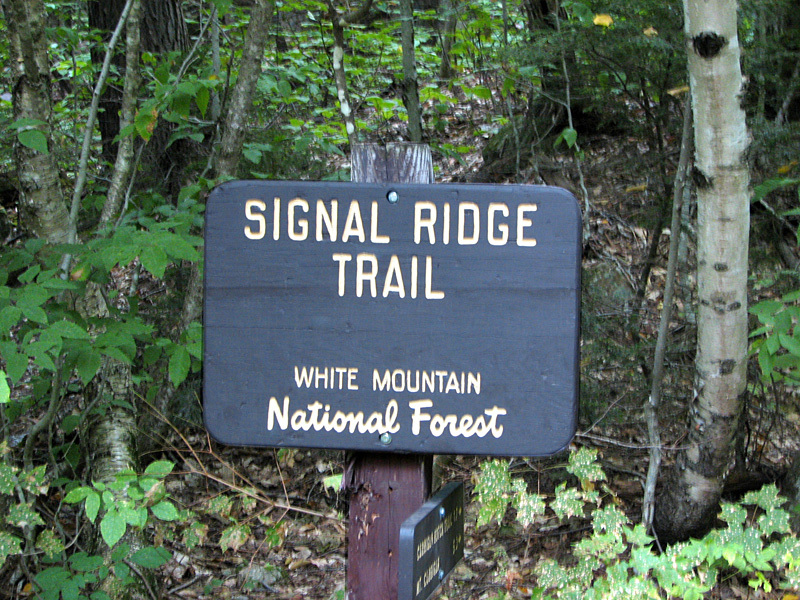 Signal Ridge Trailhead. This trail begins tqo miles from Rt 302 down the gravel Sawyer River Road. 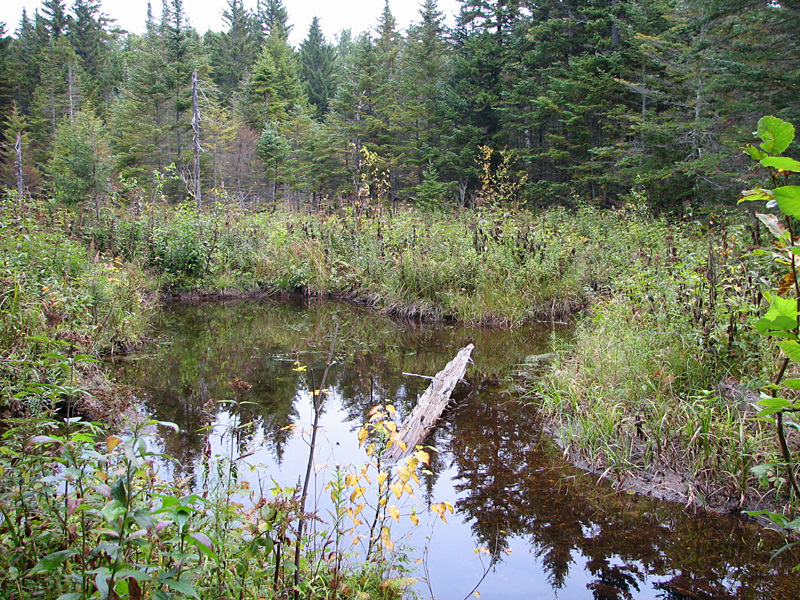 Beaver pond. The first part of the trail is relatively flat and is wet in some places, such as this spot where beavers have dammed a small brook. Signal Ridge Trail. 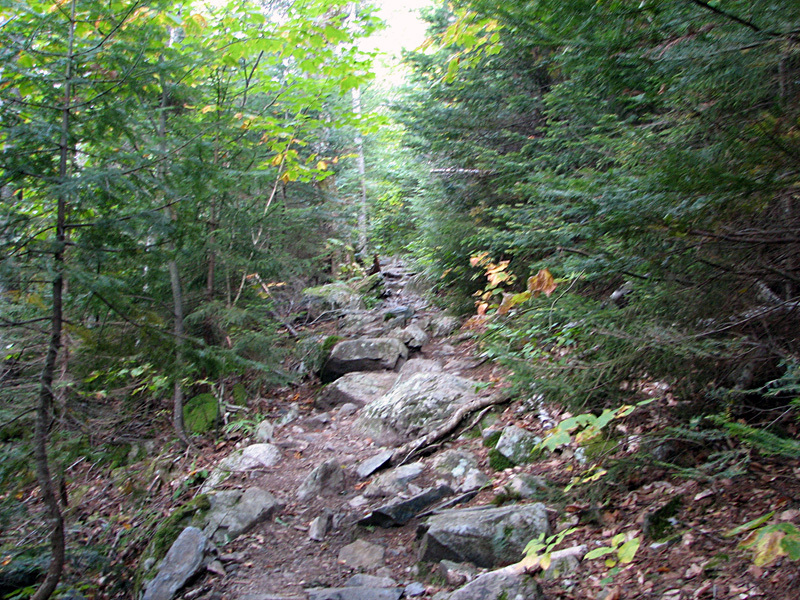 Past the junction with the Carrigain Notch Trail, the Signal Ridge Trail narrows and the grade increases slightly. Foggy Vose Spur and Carrigain Notch. Up on the ridge, the fog eerily shrouded the surrounding mountains and valleys. Mt Carrigain observation tower. Formerly a fire tower, this structure is now a boon to hikers wishing a panoramic 360 degree view. 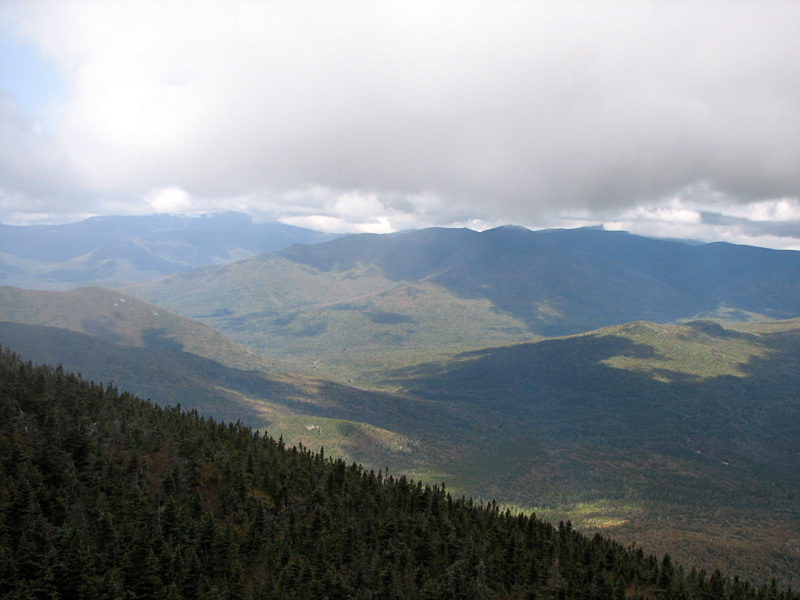 Pemigewasset Wilderness and the Bonds from Mt Carrigain. 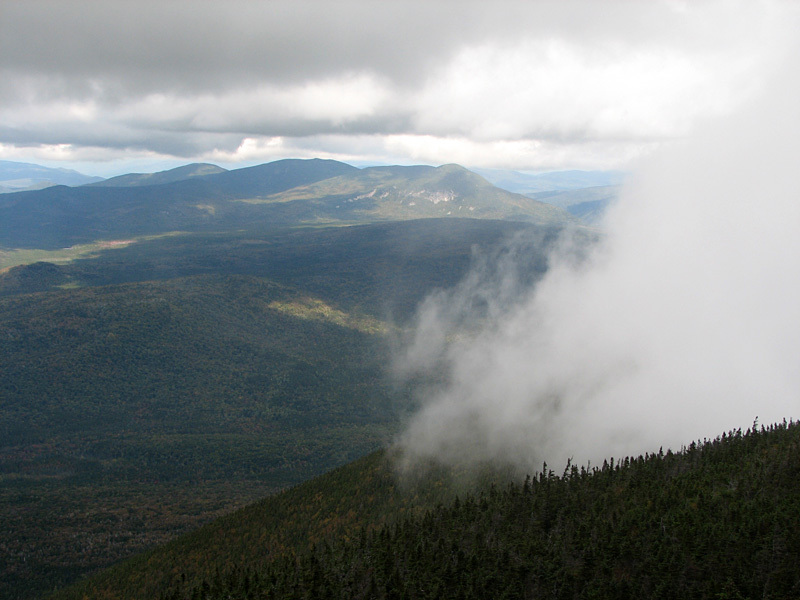 With occasional glimpses through the shifting fog, I the central and western portions of the Pemigewasset Wilderness were visible. Closeup of the Bonds, Owl's Head, and the distant the Franconia Range through breaks in the fog. 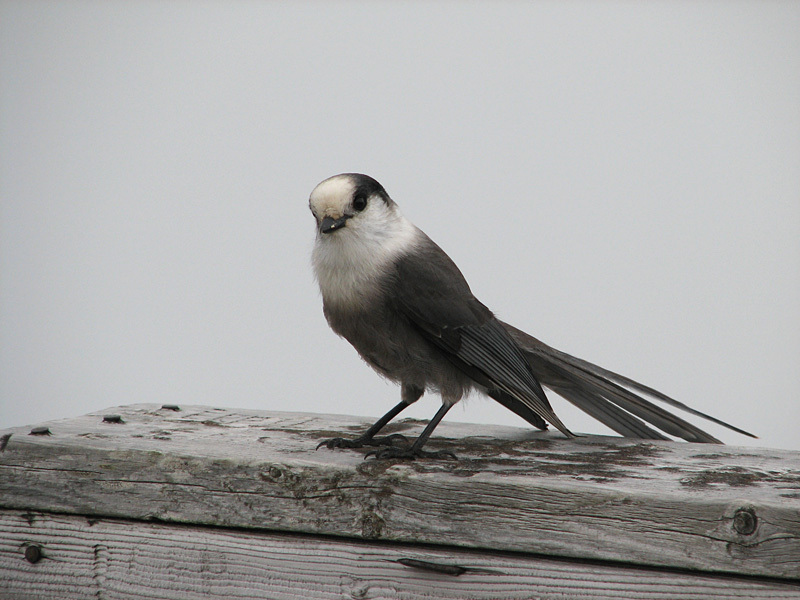 Gray Jay. 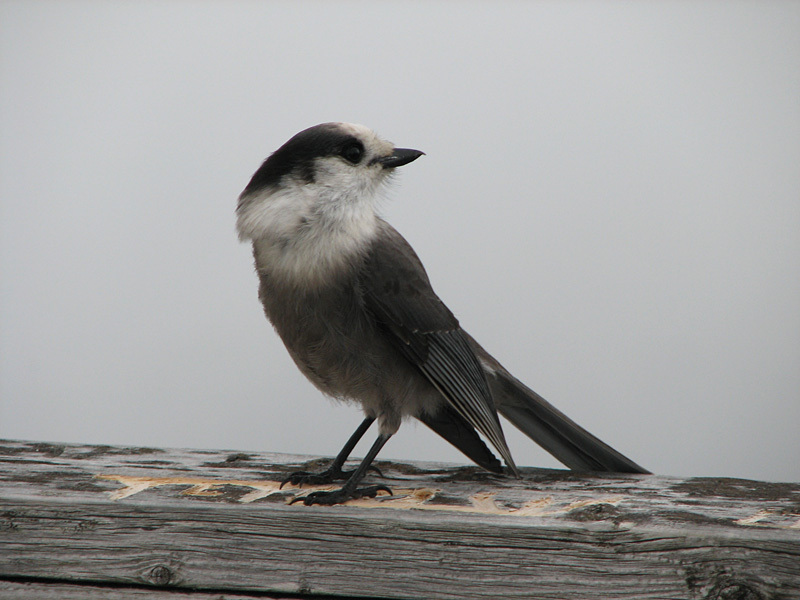 I was able to get these two nice closeup shots of a Gray Jay on the observation tower's railing because a couple of other hikers were feeding it. Southern Presidentials. As the wind blew the fog off to the east for a moment, I got a quick look at Mts Webster, Jackson, Pierce, and Eisenhower.